For many learners of English, borrow and lend are two confusing verbs. Both words have a difference in meaning. If you give something to someone, you lend it; if you take and use something from someone, you borrow it. 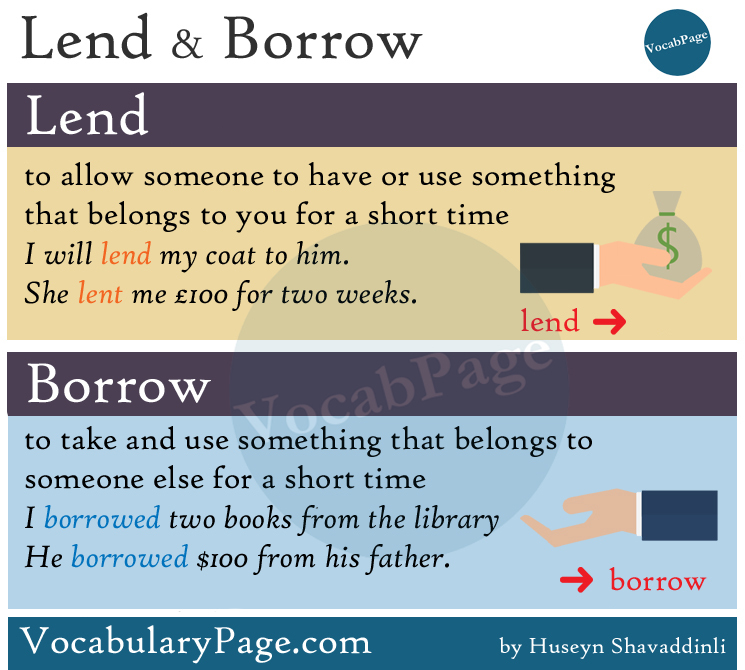 Lend means to allow someone to have or use something that belongs to you for a short time and then return. I lent Dave my car. I will lend my coat to him. The bank refused to lend me $5 000. She lent me £100 for two weeks. Loan and lend are synonyms. He loaned me $1 000. I loaned my car to a friend. Borrow is a regular verb. It means to take and use something that belongs to someone else for a short time and then return. Can I borrow your camera?= Can you lend me your camera? He borrowed $100 from his father. 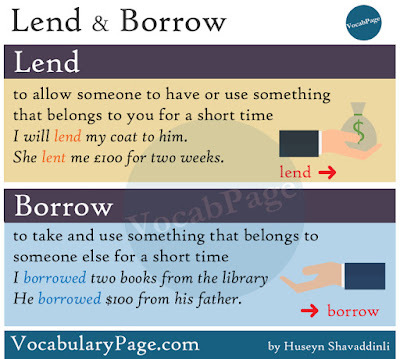 Lend and borrow are not used interchangeably. You lend something to someone, while they borrow it from you. Hi admin, Thanks for sharing this vocabularies. It is really helpful, continue sharing more like this.